Panera is joining a growing list of food companies and restaurant chains that are dropping ingredients consumers are increasingly uneasy about eating. But the St. Louis-based chain’s announcement didn’t mention cutting salt, as far as I could tell from published reports. Panera positions itself as being healthier than fast food, but like others who do the same, Subway, Chipotle, or Chicago’s Protein Bar, that positioning largely ignores the massive amounts of salt their offerings still contain. I applaud Panera’s announcement today, but ask it to look at salt next. Look at its nutrition info: its chipotle chicken sandwich, which I’m sure people might perceive as healthy, has a staggering 2,190 mgs of sodium, a day’s supply for the average person and more than I or anyone my age should eat. That doesn’t count any chips you might get with the sandwich, or any baked goods, which also have salt in them! My favorite Panera offering in days gone by was its roast beef sandwich. I don’t see that on its nutrition info menu offerings but its Asiago steak sandwich, a beef offering, has 1,340 mgs of sodium, basically a day’s worth for me! So I can never order it, unless I don’t plan to eat the rest of the day. Somewhat ironically, it has less salt than the chicken, which I think would surprise most people who think chicken is de facto healthier than steak. I do agree with you John. The few times I have eaten there I have found their food way too salty. 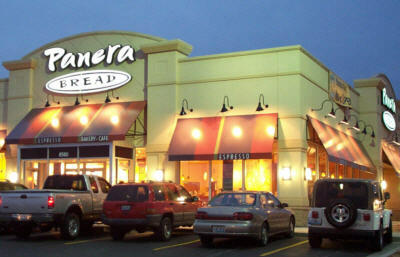 Yes, I used to go there often, but haven’t been to a Panera is three years since my heart surgery.